Know what I really love? Food that keeps forever in a jar. I don’t think my friend T would mind if I described her as “a pasta lover of near-professional status.” Or pointed out that, while many women over 30 give up pasta in favor of things like continuing to fit into their clothes, T not only mysteriously fits into her (tiny little) clothes, but she can also continue to launder them and fit into them. Nice work, T. But, enough about fashion. Back to pasta! Her favorite kind costs $8 / pound but she feels, and I agree, that it’s important to honor certain desires. We were catching up the other day in a coffee shop, while Henry honored his own desires to hoover lemon bread into his craw, when I realized that I was enjoying myself so much that I hadn’t given a thought to dinner. For me, planning dinner is usually a pleasure rather than a chore, but it is still a pleasure that needs to be addressed. Even if the result is pile shaped, I generally serve a bunch of vegetables, a starch, and some protein, even if it’s a textured vegetable version of a protein. Still, protein is the only real aspect of dinner that can be a hitch, since our speedily gentrifying neighborhood — like most New York neighborhoods — is served by mostly terrible grocery stores. If I can easily picture mice barreling headlong over the onions, then I certainly have a concrete mental block against the undated, leaking meat. Recently these grocers have been thrown into sharp relief by a spate of organic food coops cropping up everywhere. I don’t mean to sound like a grump, but at the organic markets, the protein selection is extremely expensive, seriously over-packaged, and branded to a degree that makes me jittery. Perhaps because of my company, my mind landed on pasta in a very simple, chili-flecked anchovy sauce, with broccoli. I decided to consult T about the recipe. Me: Hey, do you ever do that easy broccoli and anchovies sauce? T: Only 3x a week for dinner for years: it’s my go-to. Me: I used to make it all the time, but Matthew might frown upon anchovies. What shape does that one go with? Me: Crap. I don’t have any ears. T: Eh, it’ll still be delicious if it’s not with ears. Me: Do you think I can I slip anchovies into dinner without mentioning it? T: Is sneaking anchovies into dinner the worst thing you are planning to do to him this week? Look at your week, then decide. So I abandon the idea of serving it with the correct shape, and go home to put some water on to boil, and hand the baby to my husband, and when everyone is out of the room, I sneak the jar out of the fridge. When steaming the broccoli, don’t forget to include the stems! It is the correct thing to do in this economy, and fewer broccolis will have died for our pleasure. Plus, it’s vitamin-rich food. Just peel off the squeaky-feeling outer portion of the stalk. Replace the pan on the burner, and cook it all together for about 5 minutes. Toss with pasta (I think I used mezze rigatoni), and add some of the reserved cooking water if you want it a bit juicier. Sprinkle with more pepper and cheese. Tell them if you want to start to build a case for the fish everyone loves to hate, or just enjoy dinner, and rest assured: they’ll never know the difference. 1. Have you been reading Patrick O’Brian novels? “honored his desire ..” If not, I highly recommend, but they are a bit addictive. 2. Also addictive: your pasta recipe! I also make this two times a week. 3. 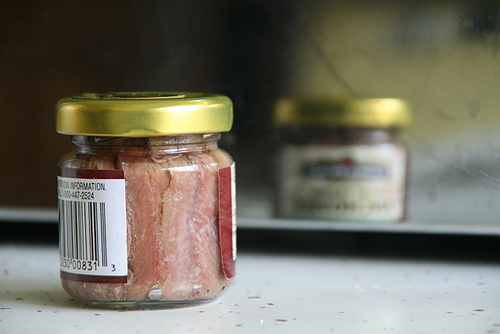 And the last addictive item: Anchovies. Delicious! Straight from the jar, straight from the can, straight onto your fork and straight into your mouth. If would eat them at every meal. I honor your blog on the virtues of anchovies, Meredith. You know, I saw a collection of Patrick O’Brian novels in the bookstore right after you sent this. And nearly bought one, but instead came home with a 19th century Spanish novel. Which I’m excited to read, after I finish To the Lighthouse. Ie, in 2042. I’ll try it! I love white anchovies, too! Do you like those? You know, I don’t know! Seems like something we maybe got at Lil Frankie’s. Is that where you get them? I don’t know but I feel like I maybe had them with you at Lil Frankie’s? This might be my favorite blog post ever! Maybe because it is about bacon and the bacon of fish but also just because it is fabulous in every direction. I’m wondering if I could start slipping more anchovies into the food around here (because I’m that kind of vegan) without saying anything. Mr. B might look the other way if I compensated by also using more capers. Which, personally, I don’t have a lot of use for but he seems to like. And they do keep a nice long time in the fridge. I am slowly adding more and more fish products to my life, so this is a timely post. I cannot decide if tiny melting bones is a good thing, or just gross. I think it’s good; couldn’t bear to have bone crunching involved. Kudos for involving the word “bacon:” I am now programmed to like anchovies merely by association. I’m with April (hi, April! are you still in Allendale? ), that was great! I don’t think I’ve ever eaten an anchovy in my whole life. So the idea is that when you squish them with your spoon, they sort of mix with the oil and become a paste? Is that right? And you just use a few? I’ll have to try. Amy that is exactly it — just a few, and it becomes a paste, and it disappears and leaves a lingering happiness. Let me know how it goes! I am afraid of anchovies, but I will try this. The comparison to bacon has emboldened me!